A Celebration Of Canada's Largest Contemporary Peony Collection Featuring Over 300 Cultivations! 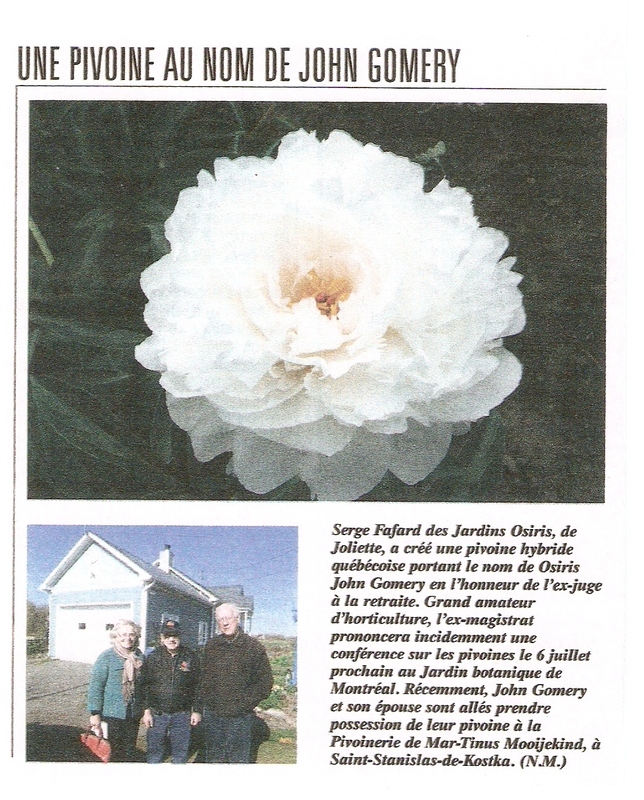 Wishing to preserve his wonderful collection and celebrate a beloved individual's passion, Gilbert´s friends and family approached the Canadian Peony Society to assist them in finding a permanent home for his collection. The peonies were moved to a farm just north-east of Oshawa where their identification was verified. In 2001, volunteers from the Oshawa Garden Club, the Canadian Peony Society and the staff of the Oshawa Parks Department moved one hundred peonies to their new home, the Oshawa Valley Botanical Gardens. Included in the collection are some of the cultivars bred by William Brown and one named for Wally Gilbert's wife, 'Irene May Gilbert'. The CPS also selected the remaining peonies, which were purchased from peony nurseries. About forty percent of the collection contains hybrid varieties, mostly from well known hybridizers including, Auten, Bigger, Brand, Glasscock, Hollingsworth, Kelsey, Klehm, Krekler, Reath, Sass, Saunders and Wissing. Many of these peonies are not widely known and are hard to find varieties. Help us make this a fabulous display. This is your chance to show off that favourite bloom. Bring your blooms and enter in the competition. See how they stake up to all the others. La Société Québécoise de la pivoine et le Jardin botanique Roger-Van den Hende invitent les passionnés des pivoines et la population en général à une exposition de fleurs coupées de pivoine. 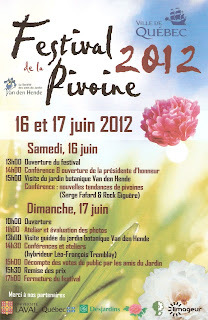 Celle-ci se tiendra les 16 et 17 juin 2012 au Pavillon Envirotron, 2480, boul. Hochelaga à Québec, sur le site de l’Université Laval. C’est le troisième festival à être tenu au Québec, après ceux de Saint-Bruno en 2010 et de Lachute en 2011. Plus de 1 200 fleurs coupées seront présentées en vase. Toutes les personnes qui sont intéressées à exposer leurs pivoines devront s’enregistrer samedi le 16 juin, de 8 h à 12 h.
Le Festival se tiendra dans le cadre du rendez-vous familial annuel du Jardin botanique Roger-Van den Hende, Trouvailles Champêtres. Plus de 40 exposants horticoles vous dévoileront leurs trouvailles. Des activités sont prévues pour les enfants, un encan de plantes, des conférences et des visites guidées. L'entrée est gratuite à la fois au Jardin botanique Roger-Van den Hende, au Festival et aux Trouvailles Champêtres. J'ai trouvé ce clip vidéo sur Pivoines Capano site au sujet de son entreprise! Avoir un coup d'oeil! Mano Capano, la plus importante productrice de pivoines au Canada, habite au Saguenay. C'est d'ailleurs depuis Chicoutimi qu'elle cultive et exporte ses fleurs à travers le monde : de Washington, en Russie, en passant même par l'Indonésie. Portrait d'une passionnée d'horticulture. Kansas, et Souvenir de Louis Bigot. Here in Brampton ON we have several varieties finished and several are still in bloom. P. tenuifolia, Species'Mollis', Little Red Gem, Smouthi, Peter Barr, Fantasia,Starlight, Mlokosewitchii from seed have all finished flowering. Athena, Early Scout, Claire de Lune, Illini Belle, Cora Louise are in bloom now with many more to come. The weather this year has been different than most. Blooms are early and not lasting as long as we would wish. One day its very hot (like August hot 27 / 28 with humidity making it 30+) and that night very cool or calling for frost. Send some photo's of whats blooming in your area. Let us know how the weather has been this spring for comparison. Peonies are up and strong in St.Stanislas-de-Kostka, Valleyfield-Salesberry on Martinus' farm. To enter, one need not be PPS member. The show will be judged and includes sections for artistic floral design and photography. For a copy of the show schedule, contact Brian Porter at bjporter@accesscomm.ca or phone 306-543-8259.